This morning we decided to brave the summer heat and gathered in our hermetically sealed, super secret, Area 51 type test installation known as "Gregs backyard", where we conducted a bit of matocide on some unsuspecting tatami mats of both single and double roll configuration. Let me apologize in advance for my poor form. I twisted my back while in the gym the day before, so I was not at my most relaxed. I've been trying to get back into the gym on a regular basis since the first of the year and every day it reminds me that I'm no longer twenty years old. The wooden post used as a base is set into the ground, with the cinder blocks added for additional reinforcement. I opened the mornings festivities with the Big Johnsson, made by Peter Johnsson. My first cut was a downward cut from right to left. ...followed by an upward cut from left to right. I don't think I blew a cut with this sword all morning. As I've said before, this is an absolutely magnificent weapon that I love more every time I use it. Greg broke out the "Beast", also known as Albions St. Maurice. We took this still photo to specifically illustrate the large size of the St. Maurice. Greg is 6' 2"-3" so this sword fits him well. I tried the St. Maurice several times myself and we both had pretty good results this time around, now that we're getting a better feel for this massive sword. Immediately after using the St. Maurice I had Greg switch to the Albion Reeve. I wanted Greg to feel the difference between such a massive sword and one like the Reeve. He was impressed by the Reeves easy handling qualities when compared to a much larger single-hander. I had to give this butcher knife of a sword a workout too. I've never done any cutting with Milestone, my custom sword by Vince Evans. I decided to remedy that. My patented "sucking the lemon" look. There were no big surprises with this one. Milestone cut through the targets with ease and authority, but considering who made it that's no shocker. The final sword used was the Albion Baron. This is a particular favorite of both Greg and myself, as it's really one of the easiest cutting swords we've used in this type of excercise. It almost feels as if the sword is doing the work and you're just along for the ride. Two pics of the Greger himself. Overall we had good success this afternoon. Greg took a few pics with his camera, including a few of my 12 year old son Sean cutting with the Reeve. Hopefully we can get a few of those posted. On Seans very first session with a single-mat roll he executed three flawless cuts, as if he'd been doing it for years. Greg and I raised our eyebrows on the first one and our jaws were hanging open by the third and final cut. The boy's a natural! Good to see you posting again Patrick! 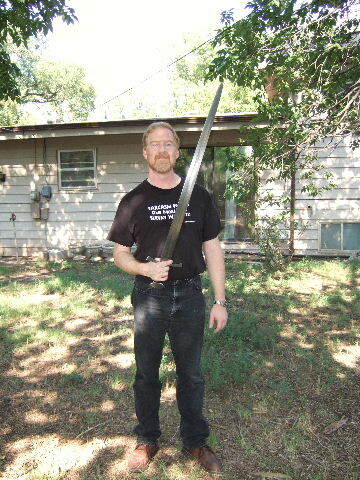 I really like the picture of Greg and the St. Maurice sword; it really gave me a much better impression of how big it is! Looks like you guys had a good time. I went out back myself today and executed a few milk jugs lying around with my Crecy. Milestone was my first real quality custom piece, hence the name. It certainly is a visually striking sword. It strikes pretty well from a practical standpoint too. All of the swords are beautiful. Milestone is especially eye-catching thanks to its double fuller. Which one would you say you had the most fun cutting with? The Maurice looks absolutely terrifying. Capable of producing Maciejowski-esque cuts, I'm sure. Great shots (I particularly like the ones of the Reeve), and thanks very much for sharing them. Some nice action shots, 1st and 2nd action shot pictures show some Samuri moments! It's easy to see the St. Maurice is a fearsome and huge beast of a one hander sword! Reeves looks like a swift sword, the "Big Johnsson" I've always liked and wondering when you are going to Christen the "Milestone"? I've not done any mats yet but on Thursday nights I go about the neighborhood capturing detergent jugs from my neighbors garbage and cat litter jugs too. The most fearsome cutters I have in the two and one handed category respectively are the A&A Highland Claymore and the Albion Berserkr. Those mats look like a lot of fun, I gotta look into this. Nice cuts and awesome swords Patrick and Greg! It's so great to have you back posting Patrick!!!!!!!!!! Nice pics. Looks like you and Greg had a good time. Nice choice of swords to cut with, very impressive. I hope you take some pics of you guys cutting with the Svante when you get that one. Thanks for sharing. By the way after looking at the photos again your form doesn't look bad. Your cuts look pretty clean to me. I suppose if I had to pick one favorite, it would have to be the Big Johnsson. I know that comes as a surprise to many here. 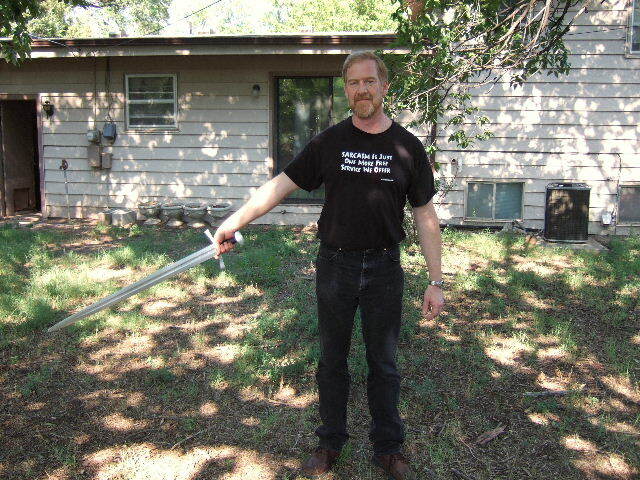 For such a large single-handed sword, the BJ has amazing handling qualities and it's an outstanding cutting sword. The craftsmanship put into its manufacture is also second to none. The Baron is such an easy sword to cut with, it makes rank amatures like us look like old pros. Also, since it's one of my favorite sword types from the age of mail I really enjoy using it. The Reeve and the St. Maurice provide a fascinating study in contrast. The Reeve is such a handy sword with cutting abilities that exceed your perceptions when you pick it up. Every time I cut with the Reeve the poem The Jabberwocky comes to mind, especially the line, "His vorpal sword went snicker snack!" On the other hand, the St. Maurice is an excellent example of the importance of mass distribution. It's a huge sword, there's no other way to describe it. However, once you figure out the neccesary technique for handling it, it turns into a monster cutter. Thanks John. I suppose my feelings on that come from my years of competitive fencing. "Keep the torso straight." "Maintain your center of gravity." , etc., etc. Everytime I see a photo of myself leaning into, or out of, a cut those old words come back to me. Oh yes, we''l be seeing a bit of the Svante when it arrives! Yes, I always find the aggressive destruction of material things quite relaxing. Are the pool noodles awaiting a later execution? I wondered when someone would notice those. We tried using the pool noodles as targets during our first cutting session and found them to be pretty worthless for that use. Despite the cost I really prefer to use tatami mats for cutting exercises. I just get a better feel for, not only what I'm doing, but how the sword's behaving as well. In trying to analyze the entire cutting process I find them to be superior to things like noodles, plastic jugs, etc. That's not a condemnation of anyone who chooses to use those things, so no one should feel the need to jump in and defend themselves on that. In the end you need to use what you've got or can obtain. We had a few noodles left so we had them out in case we ran through the rest of our mat supply and still wanted to continue. However, after two hours of mat cutting Greg and I were both about done. Our arms and shoulders were protesting, not to mention my back. These kinds of activities really give you an appreciation for the people who used these things in earnest over the course of a battle. My son Sean during his first cutting experience. Greg snapped this interesting one of the Big J in action. This illustrates how the blade flexes during a cut. That flexing blade shot is interesting, Patrick. (I've not done any cutting exercises with my swords.) Might the flex be a sign of your alignment of cut versus arc of swing being slightly off? That's an interesting question Steve. That could be, however, in the photo of me cutting with the Reeve you'll notice a bit of flex in the swords blade post-cut and there was nothing off center about that particular cut. I think it may be more of a characteristic inherent to european sword designs like these. The blades are pretty flexible compared to other types. I've seen other photos were the flex is much more pronounced. 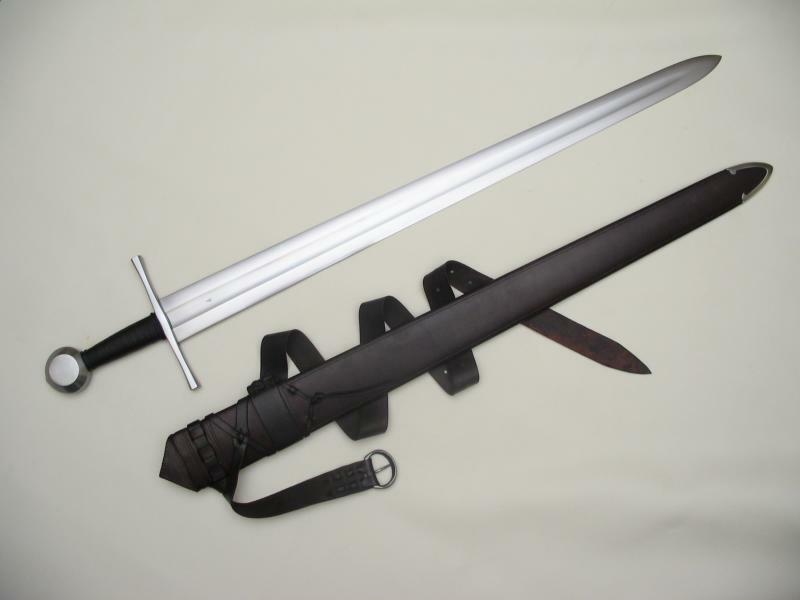 Ah yes, I don't think it would be possible to have two more diametrically opposed forms in swords than what you see between the Reeve and St Maurice. Patrick calls the Reeve an overgrown butcher knife, and in a way that is true. Yet, to me at least, of the pair it is the delicate, light, lively, and responsive blade that seems to merely sing it's way through the cut. It has "blade presence", yet in such a muted way as compared to other blades of it's type, it seems to amaze and delight with each and every cut through the medium. You feel the cut, and the slowing of the blade as it passes through the grass mat, so you know you have hit something; yet 'tis a sweet flow beyond that minute hesitation, and then on through with the swing. Then you have the St Maurice. The "monster". In several practices cutting and just working freehand with this blade, there is no doubt that as Patrick writes, it represents the completely opposite end of the spectrum. It gives new meaning to the respect I have for the fellows of old in their abilities and strengths. When you pick up this blade, the "presence" literally overwhelms, and you immediately wonder what a man on horseback had to be thinking as he drew it out to fend of the saracens in the Crusades. When swinging at a target you wait for that tug and pull or at least slowing in velocity as it reaches it's intended victim - surprise crosses your mind as you think "Did I miss? ", for it glides through with a massive swipe and no feel at all transmitted to your hand or arm when the sword rings and the be-headed piece falls to the earth. To be sure, the morning was fun, and relaxing, and yes my arm did tire from swinging the swords in a too short of time. And yes, I would do it every day if I had the chance. There wasn't a sword tried that we didn't enjoy. Each one has it's distinct characteristics, and every one was a true pleasure to hold and cut with. I'm glad for the opportunity to do so, and look forward to trying other blades in the future. Can't wait to take pictures of Patrick with the Svante! Nathan, I must apoligize as I said I would get some pictures of the St Maurice showing the size over a month ago. Well our trip to Scotland kind of took over all my time and I haven't had the chance until now. As Patrick said, I am around 6'3", so that should give you a reference on it's size. I have a suggestion. Judging from the photos, it looks like everyone is taking a passing step forward with the cut, which is good to see. It would probably help if you bent your knees more. When you bend your knees you can step with greater ease and effectiveness, and we've got good indication that it was done historically, which should be no suprise given that bending one's knees is common in athletic movements, and sword fighting most certainly is athletic. Thanks Craig. Actually, just about every one of my cuts was executed from a standing position with no passing step. I normally do exactly that, however, with the way my back was feeling the extra movement made things a bit too uncomfortbale. It's funny you should mention bending the knees. As Greg can attest I kept telling my son to do that very thing, for exactly the reasons you've indicated. (and scolded myself for not doing so after viewing the photos) It just goes to show we should practice what we preach.